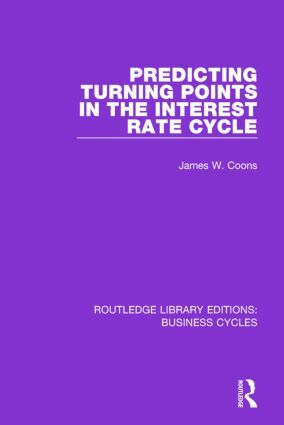 Originally published in 1994 and the recipient of the Stonier Library Award, this volume evaluates an alternative approach – the sequential filter- to managing the uncertainty inherent in the future course of the interest rate cycle. The specific hypothesis is that the sequential filter can produce valuable signals of cyclical peaks and troughs in interest rates. The analysis focusses on US interest rates from April 1953 to December 1988. 1. One-Year Treasury Note Yield: January to December 1989. 2. Selected Interest Rates: 1980-1989 3. The Composite Interest Rate Cycle Index: (CIRCI): 1953-1989 4. Interest Rates and the Business Cycle: 1946-1989 5. Cyclical Peaks and Troughs in the Composite Interest Rate Cycle Index (CIRCI): 1953-1989 6. Comparison of the Timing of Turning Points in the CIRCI and its Components: 1953-1988 7. The Credit Market 8. The Leading Inflation Index and the CIRCI: 1953 to 1989 9. The Case of the Missing Signal: January to December 1981 10. Conditional Probability Distributions Observed and Smoothed: August 1953 to December 1988 11a. Sequential Filter Turning Point Probabilities: August 1953-January 1972 11b. Sequential Filter Turning Point Probabilities: August 1971-August 1990 12. Sequential Filter Turning Point Probabilities Looking For a Trough: March 1989 to October 1993. Originally published between 1925 and 1997 the volumes in this set: Discuss the Impacts of Profitability, Business Cycles and the Capital Stock on Productivity; Evaluate various approaches to managing the uncertainty inherent in the future course of the interest rate cycle; Examine the combined effect of financial instability and industrial restructuring on postwar economic growth and recession in the US; Determine what statistical and other information is needed to formulate both the objects and the means of government economic policy; Ask what theoretical tools should be used in order to clarify the issues of economic policy; Examine the sociological aspects of the business cycle.